To co-write Homes: A Refugee Story with her student Abu Bakr al Rabeeah, Yeung had to get out of her own head. Leading up to Canada Reads, CBC Arts is bringing you daily essays about where this year's authors write. 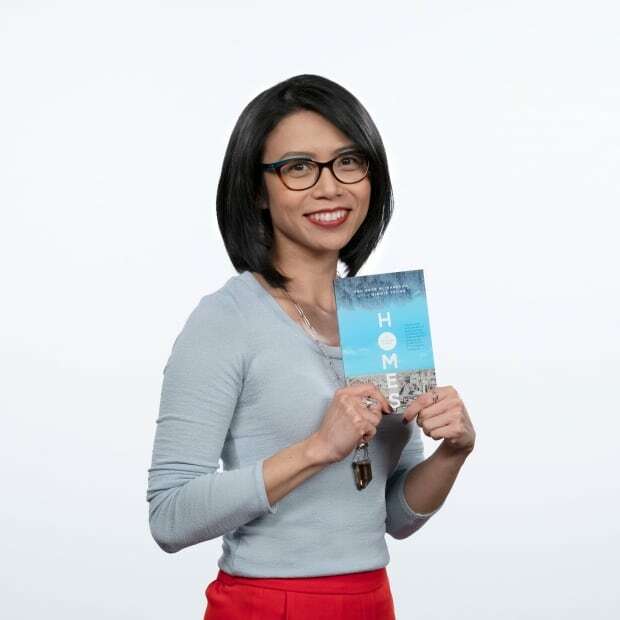 This edition features Homes: A Refugee Story co-author Winnie Yeung, who wrote the book with her student Abu Bakr al Rabeeah. Writing someone else's story is a very different kind of writing. The voice you create in is not of your own rhythm or timbre, nor is it a fictional one birthed by your imagination to mould as needed. In order to be authentic to another person, you have to get into his headspace. For Homes: A Refugee Story, I had to get out of my head and into Abu Bakr al Rabeeah's — and the places I worked in played an integral role in enabling that process. The first step of immersing myself in my student's world was the interviews. Abu Bakr, a Syrian refugee, wanted to share his story, and our journey began with months of talks at lunch or after school in my office in the Highlands School library. My office-teaching space was a happy mess of books, markers, cue cards and toys — a cozy, little bubble where a ninth-grade boy felt safe enough to share his life with a teacher he had only known for two months. The tall windows looked onto a street lined with old trees, and we both often stared at those trees when words failed us. Abu Bakr had only been learning to speak English for eight months, so the storytelling was slow. He would gaze outside, momentarily reliving a memory, before he typed away in Arabic on Google Translate. He was learning English as we talked about his life, but my heart splintered a little when I had to teach him how to pronounce words like "sniper" and "explosion." Often, I stared hard at those snow-covered trees outside, blinking away tears of sadness and frustration, trying to digest the idea of growing up in the middle of a warzone. Writing was a way for me to process everything Abu Bakr and his family shared with me. Like many teachers and writers, I like working in a coffee shop abuzz with music and conversation, but it was far too public a place for me to write his story. You see, as I began stitching together the narrative arc, our sparse conversations only offered a vague transcript of a young life richly lived. Often, Abu Bakr's memory failed him, or it felt wrong to dredge up graphic details he didn't offer, so I relied on my own research to fill in the blanks. Watching shaky cell phone videos of massacres and car bombs frightened me. Thinking about how many Syrian children were caught in the violence made me shake with a sense of injustice. Writing about all that made me want to cry...and you can't cry at your computer in a coffee shop. Not only that, but I realized the maxim of "write what you know" did not apply here at all. I grew up in the safety of suburban Edmonton — how was I supposed to write convincingly about army checkpoints and AK-47s? Thank goodness for the internet. I studied photographs and posed like a soldier, miming out where to position my hands on gun, mimicking the cocky swagger so I could describe it in the book. Again, this is not appropriate coffee shop behaviour. And it wasn't just a matter of privacy. To immerse myself in Abu Bakr's world, to process my emotional exhaustion, it wasn't a physical location I needed: it was a feeling. I needed to feel like I was safely tucked away from the rest of the world in order to write a story that scared me. My kitchen at night was one of those places. While the rest of the household slept, the dim light and peaceful stillness felt like a warm den. Like the good little lap dog she is, my black pug Zoe watched over me as I struggled at my laptop, her soft snores a soothing soundtrack. Zoe also developed a new habit of sleeping tucked between me and the back of my chair — a sort of pug lumbar support, if you will. 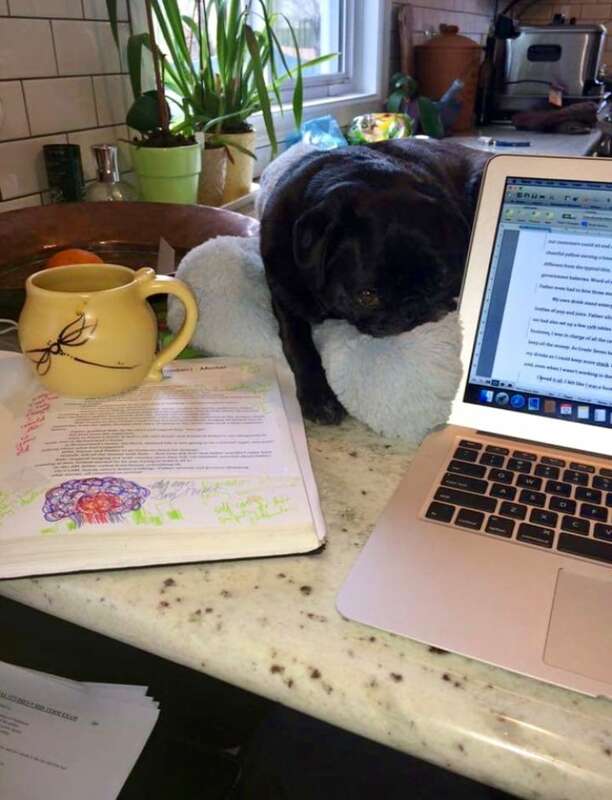 In the privacy of my kitchen with a warm pug at my back, I was able to write despite my fears. When I finally had the al Rabeeah family's story stitched together, I turned back to Abu Bakr's voice. In those excruciating rounds of edits, it was important to me that the book sounded like he was telling his own story even though my own voice kept creeping in. And with a publication date looming, my own insecurities as a writer often paralyzed me. Every self-doubt peered over my shoulder scrutinizing each word on my screen. It took a river to sweep all that away. On the rocky banks of the Koksilah River, nestled amongst my favourite old trees and treasured friends, I gave in. The soothing sounds of the water rushing below swept away my anxiety and I surrendered myself to all the precious memories the al Rabeeah family entrusted me with. This secluded refuge on Vancouver Island was where I felt most at peace, and I knew that if I gave myself up there, the river would bring me back to myself again. So, I borrowed a friend's lawn chair, dragged it to a secluded spot on the riverbank and made myself a wobbly tree stump table. There, in my makeshift outdoor office with my pug sleeping in the sun nearby, I finished writing my first book: Homes.